I think this might be the first quilt I can check off my ‘to finish’ list, though as it happens, I didn’t finish it, Angela did! But let me back up for a minute… some of you might remember way back when when I made this quilt top. It was long before the Flea Market Fancy reprint, so after spending a lot of time collecting these prints, I decided to bite the bullet and cut into a whole bunch of them to make this queen sized quilt top. You can read more about it here if you care to. I got it back recently and wow, I can’t believe how her quilting totally made this quilt into something really special. 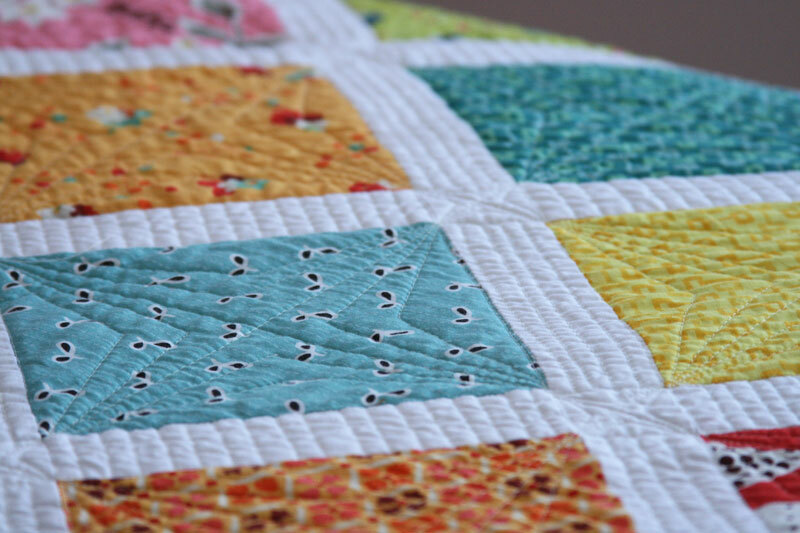 She’s used several different straight line quilting designs in the blocks and a variety of additional quilting designs through the sashing, even continuing the sashing into the border in places. a variety of perfect little cornerstones! 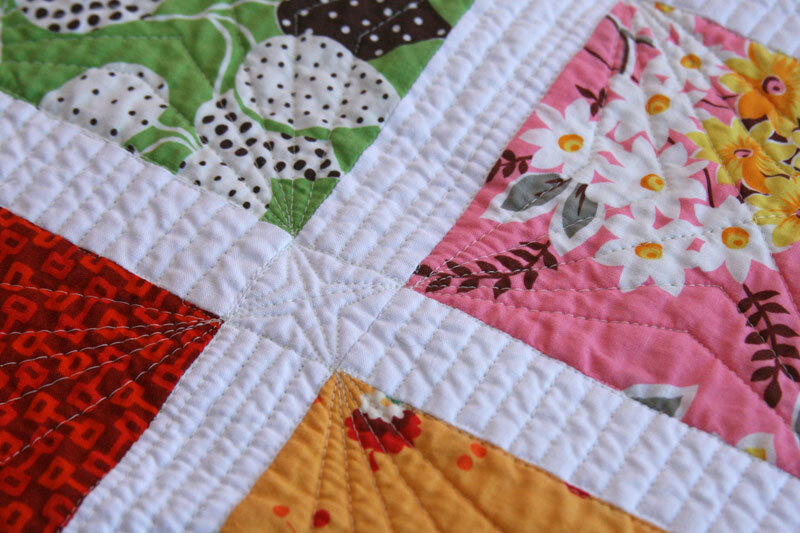 This little bit – those couple of crossed lines – falls near the center of the quilt, and it makes me smile every time I see it. I opted for a really low loft batting because I wanted this one to be a summer weight quilt. Of course, now that it’s on the bed I can’t imagine taking it off, so it’ll probably be a year round quilt! The backing is mostly a Kona gray (ash? 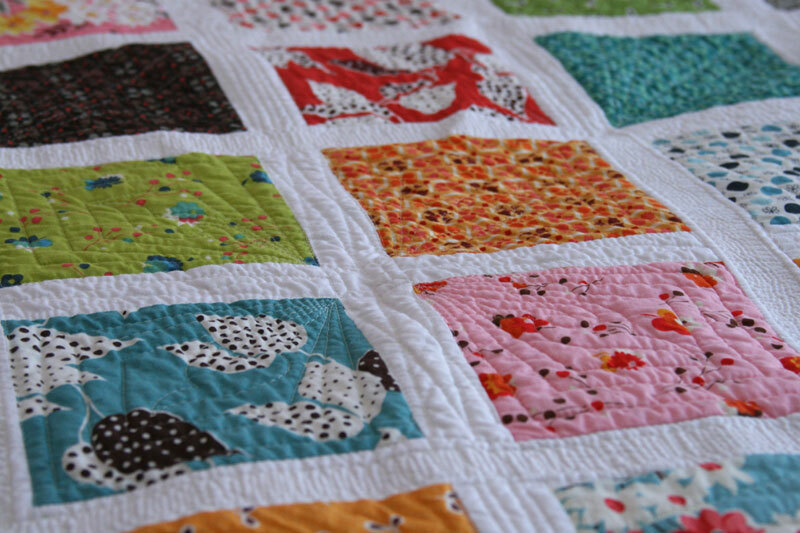 ), and nicely shows off the gorgeous quilting. If I were willing to take it off the bed, I might have been able to get a photo of it, but since I’m not, this little peek will have to suffice! This entry was posted in Posts about Quilts, Quilts and tagged angela walters, denyse schmidt, flea market fancy, on point, queen sized, quilt. Bookmark the permalink. Beautiful quilt. It really lets the Flea Market Fancy shine. And I totally agree with you about Angela’s videos. I usually end up watching them over and over. They never get old. Congratulations on your first 2014 finish! Love your quilt! 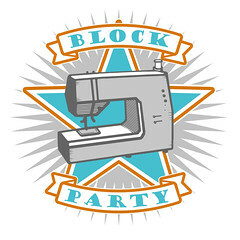 Yes, Denyse created a fabulous fabric line, you pieced it well with sashings to showcase it and Angela topped it off with popping quilting. Congratulations and Enjoy! It’s wonderful, and so beautifully quilted. Beautiful! Flea Market Fancy is one of my favorite fabric lines and love how all the prints are displayed here. This is so beautiful! I love how this turned out. The piecing is simplistic, but it just pops! 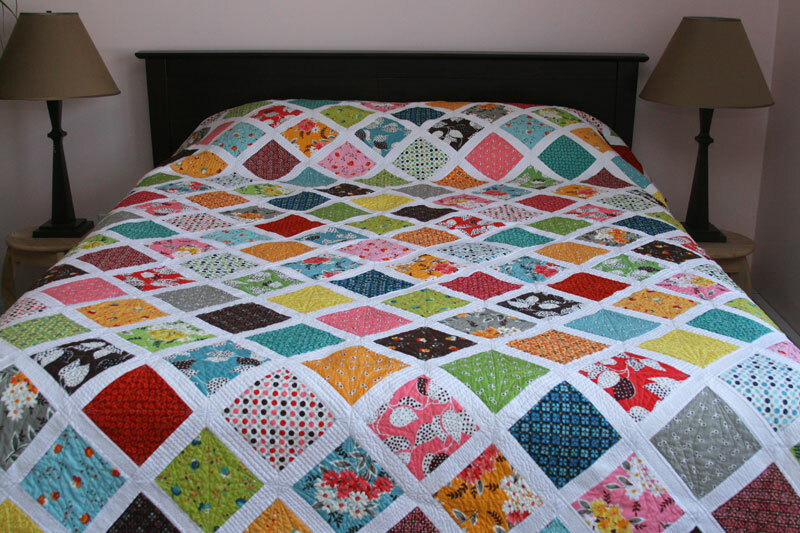 You’re quilting looks amazing! Congrats on your finish!! 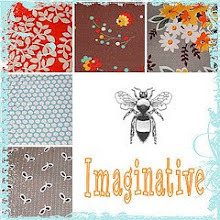 I love Lea Market fancy, it will always be one of my favourite ranges of fabric, and this looks gorgeous. Love the Marimekko Unikko fabric above the bed! I’ve never seen that colorway in that scale. Any chance you remember where you got it? Thanks! This is so lovely…of course I am a HUGE Flea Market fan…and a ever BIGGER fan of Angela’s…. The two you are AWESOME! i love it. it really has some great colors in it. Great job and awesome job by Angela as well. Beautiful. Always loved Flea Market Fancy and now I love it even more. 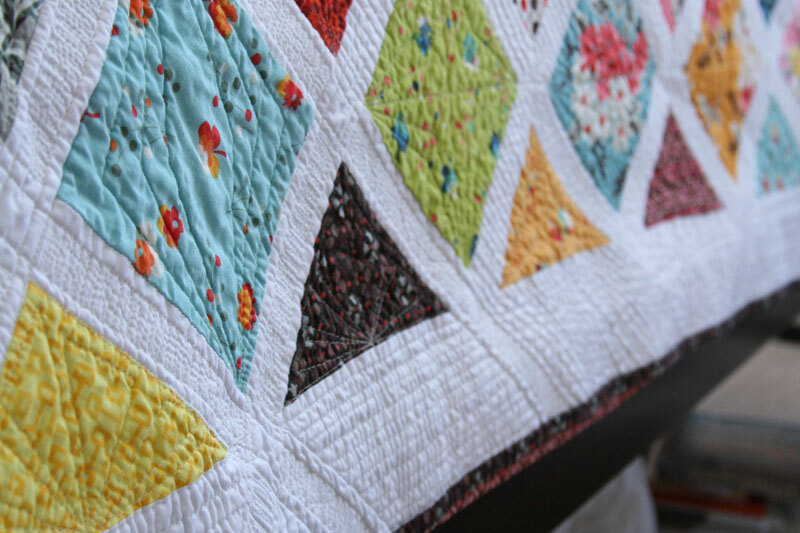 This simple quilt layout is so perfect for those vibrant colors…. I love it! It really is stunning. Yeah for you. Congrats on the finish! I always really liked this one of yours. this is one of the most beautiful and fun quilts I’ve seen. So nice to see it at home on the bed. Congratulations! Do you have a tutorial for this quilt, or is it a purchased pattern? If it is yours, what size are the squares, side squares, corner squares and sashing? I am in love with American Jane Potluck and have been hoarding it for such a quilt as this!!!! This is gorgeous! I haven’t been able to cut into my FMF yet. I pull it out every so often to pet it, and have even gotten as far as holding the rotary cutter in my hand before chickening out. LOL! Maybe soon. Wow! Beautiful. May I ask, did you only use fabrics from FMF or were there others included? Thanks! If it is yours, what size are the squares, side squares, corner squares and sashing? 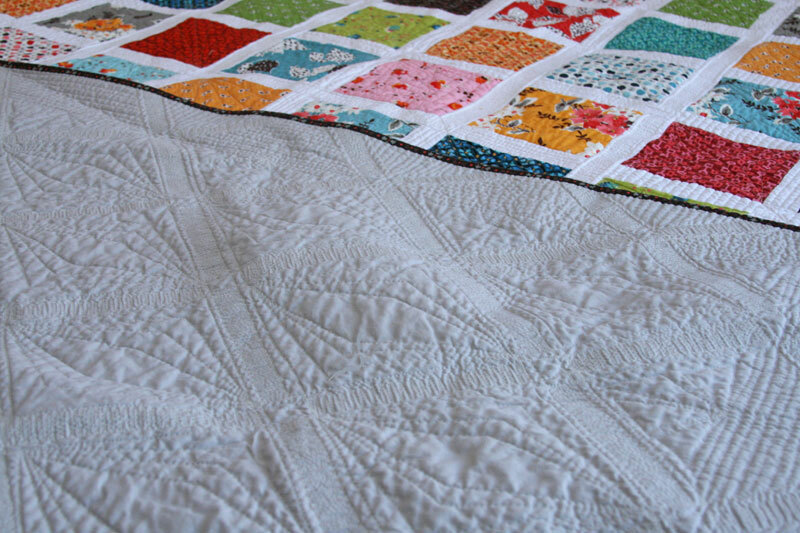 I am in love with American Jane Potluck and have been hoarding it for such a quilt as this!! !I also have a secret hoard of Flea Market Fancy…waiting for the ‘perfect’ project! I’m in love with this quilt and specifically the quilting! 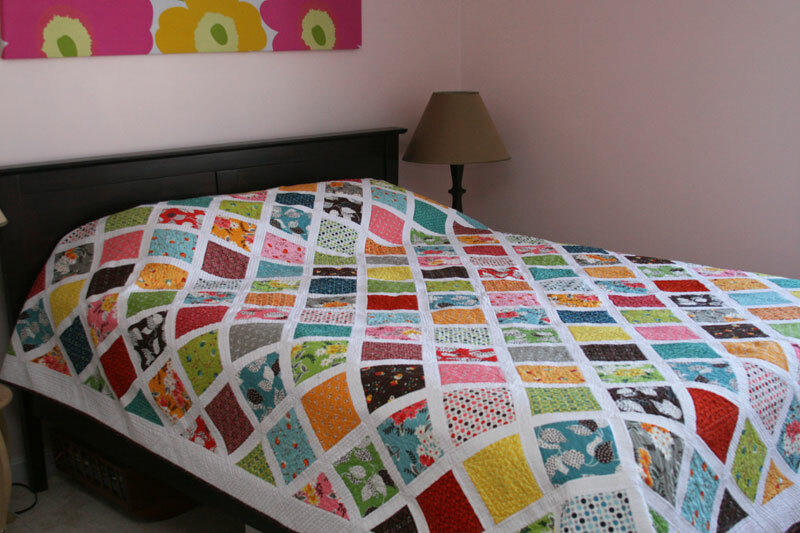 Do you by any chance have any larger size photos that show the quilting straight on? I’m trying to figure out how it was done….if all the white sashing sections have the same lines quilted…..it appears that some of them have different kinds of quilting in it? I’ve got a very similar quilt I’m trying to figure out how to quilt and I LOVE this. 🙂 Thank you SO much for sharing!!!! !